I’ve signed up for this race 2 or 3 times before but have never been able to do it for various reason. This year I made it and was very interested in what one of the biggest races in London had to offer. I was pretty organised the night before so the morning was pretty chilled. I got dressed, had a cup of tea, grabbed a banana and wandered off to the train station. The train was probably 80% runners. Obvious by their leggings and Cancer Research Bag Drop Bags. I was strangely nervous so stuck some tunes on and tried to relax. Purposely, I’d taken 30p with me and it quickly came into use, as I suddenly needed the toilet when I hit Waterloo station. (A good move as the queue at Charing Cross was huge). I had timed it nicely so got to Trafalgar Square, stripped off and checked my bag and jogged slowly towards the start line. A note on the bags provided – they were quite small (maybe half the size of a “normal” one). This was maybe a conscious decision from the organisers for a multitude of reasons, but at a race called the “Winter Run” the likelihood is that runners are going to have plenty of gear. I mindfully wore a light fleece and puffer jacket so I would not run into problems. On my jog/warm up, I spied some loos with no queues and nipped in for safety wee. I was in the first wave so there were not too many people in front of me (i.e. I could see the start maybe 50m away) when I got to the back of the pack. Slyly joining the back of a group who were snaking their way forward meant I jumped a few more places. The weather was lovely but it was cold. Crisp blue skies and bright sunshine. I had shorts on, 3 layers on my top, a light woolly hat, gloves and had accidentally left my polar buff on. There were 10 waves (done in colours) from 9.30am to 10.42am, (one every 8 mins) depending on your predicted finish time. I’m not sure how rigorously which wave you were in was being checked. I saw one guy at the entrance to the start area intently studying numbers but that was it. People also had old jumpers and tops over their numbers. I had a good survey of people around me and they all seemed to be in the correct wave. At such a big race (25,000) it is obviously difficult to manage and events do rely on people doing the right thing. After a half-hearted warm-up (I’m not sure that organised warm-ups are particularly required, but most events seem to think they are necessary) we were off, bang on time. 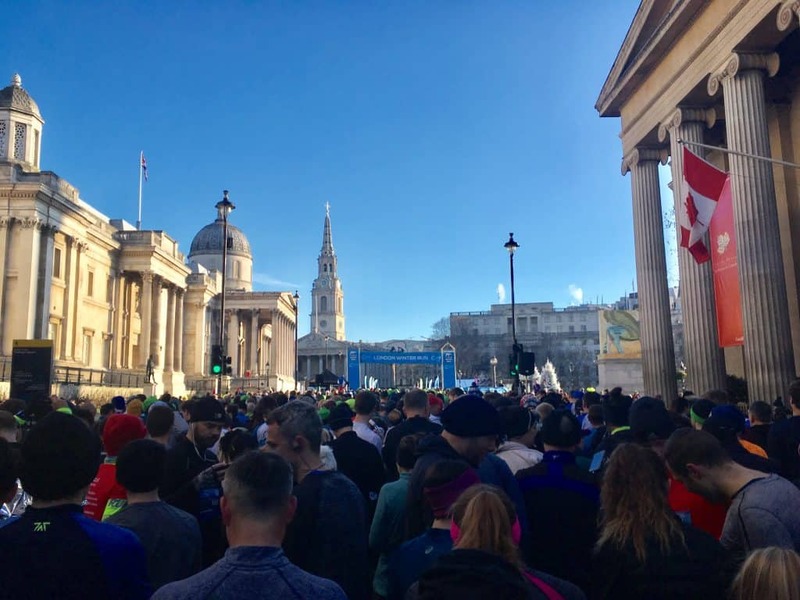 After a narrowish start across the top of Trafalgar Square and the front of the National Gallery, the course widened up. 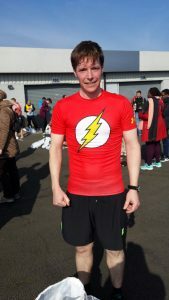 It helped that many people were running a similar pace, so overcrowding and slower runners were not an issue. I wasn’t really sure what my race plan was. My marathon training has slowly caught up with me. I breezed through the first few weeks, but gradually my legs have felt heavier and stiffer every session. That was the case today too, with some mild DOMs for the previous day’s circuits and parkrun. Sub 50 was an achievable aim. There was plenty of entertainment out on the course. The pack of people dressed as Huskies with the chorus to the Baha Men’s classic “Who Let The Dogs Out” on repeat. Fair play to those guys! There was also a full gospel choir singing “Only You” by Yazoo that I thoroughly enjoyed. I do like a London City closed roads run. The course is a twisty one around the streets of Covent Garden, Holborn and the City of London. I lot of people say that they enjoy the sightson such runs. I must say, I don’t pay a lot of attention to them. I’m fairly focused. There were a few times I spotted something and thought “oh that’s nice”. St Paul’s Cathedral is always impressive and the busy Strand with great crowds and lots of confused tourists was excellent. I managed to stop thinking about myself for a minute, take a bit of it in, as well as high fiving some kids and snowmen! The event supports Cancer Research UK and helps raise vital funds, but it also encourages people to get active and to hopefully stay active. As I was coming back through the sections where you can see the runners going the other way, there were groups having lots of fun and did not look particularly obsessed with pacing or finishing times. There was one water station on the route (around the halfway point) giving out bottled water, which I didn’t take. I was still not particularly warm or thirsty and would only have taken a sip and then thrown the bottle way. There were conveniently placed bins after the water station with big “backboards” to hit so strewn bottles over the road was kept to a minimum. I’m still not sure what the solution is to plastic use at water stations at running events. A bottle is easier to drink from than a (paper) cup when you’re on the move, so it’s a more popular choice. However, the UK does not have the infrastructure to recycle its own plastic waste. “When China banned imports of plastic waste a year ago, you might have hoped that the UK government would invest heavily in waste reduction and domestic recycling. Instead, it has sought new outlets for our filth. Among the lucky recipients are Malaysia, Thailand and Vietnam, none of which have adequate disposal systems: as I write, our plastic is doubtless flooding into their seas”. The best way to reduce plastic on a personal level is to stop using plastic. Aluminium cans are an option, which has a much higher recycling rate than plastic and most aluminium in a product is already from a recycled source. I got my medal, a coconut water, a protein bar/cake and a mini Soreen loaf. 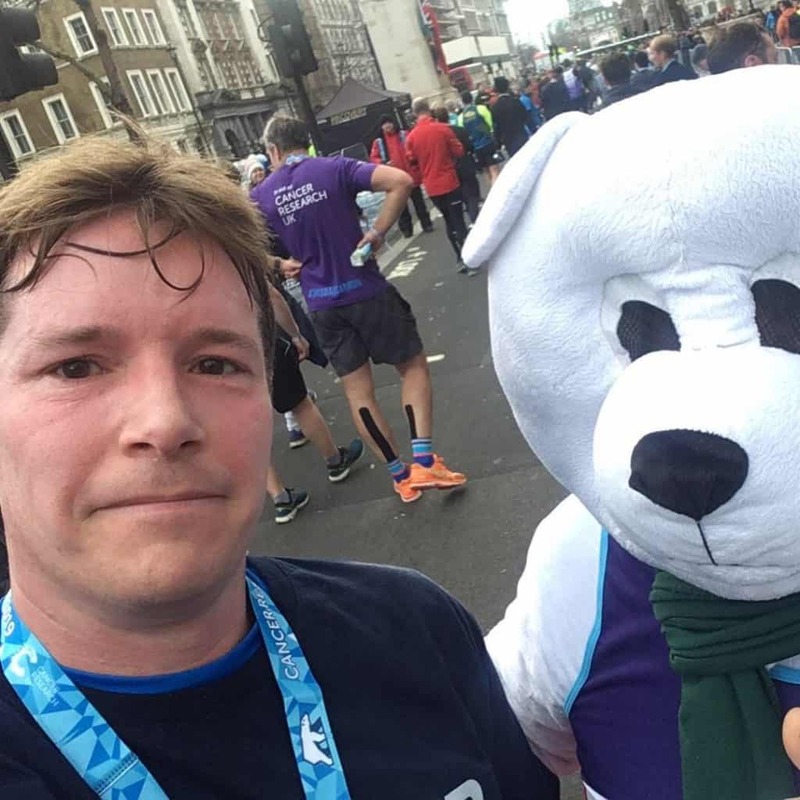 I was offered another bottle of water but instead opted for a selfie with a polar bear. The walk back to the bag drop was around Horse Guards Parade and via The Mall back to Trafalgar Square. It took well over 5 minutes, probably closer to 10. I needed to put my hat back on as I cooled down very quickly. I can see the thinking in this as it creates a one-way system for incoming finishing runners and ones heading to pick up their bag. The last thing you want to do is to run again after having finished running, but I had to, to combat the cold. One thing I haven’t seen before is a one-way system bag return. 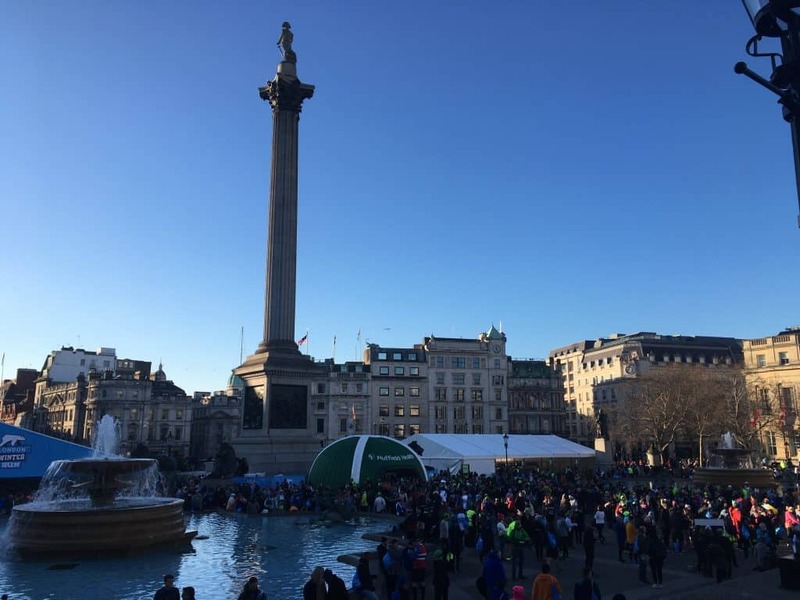 You showed your wristband at one end, walked through a narrow corridor, collected it at a counter the other end and it shoots you out into the “event village” in the middle of Trafalgar Square. That I really liked. I dressed quickly, stretched off, watch some of the runners coming around the corner in the finishing straight and gave them a shout, then headed home for some breakfast. A well-timed event in the year, that gives many runners an event to aim for after New Year. A big London City fully closed road event. Good organisation and lots of volunteers – I quickly moved through the drop-off, getting to the start, race, bag collection and getting away from the event. I was in the first wave, so possibly avoided any busy-ness. Price – I paid £37 with 3.70 booking fee. Just make it £40. I hate booking fees! Pricey, but most city closed road events come in around this mark. Plastic bottles at the water station and the finish. The organisers – Human Race as “the largest and most diverse mass participation events company in the UK” should look into alternatives. The long walk from the finish to the bag pick up, especially in such cold temperatures.